University of California, San Diego Health System is one of only a few hospitals in the nation to offer computer-assisted navigation technology with the direct anterior hip replacement technique, potentially resulting in less pain, faster recovery and fewer dislocations for patients with osteoarthritis and other forms of degenerative joint disease. Only 15 percent of the top joint centers in the United States have the expertise and technological capability to perform an anterior hip replacement, where the incision is made in the front (anterior) of the hip as opposed to the side (lateral) or back (posterior). The anterior approach allows the surgeon to work in between a natural muscle plane without detaching muscles or tendons from the hip or thigh bone, avoiding undue trauma to the muscle and surrounding tissue. UC San Diego Health System performs a high volume of anterior hip replacements annually, making it a leader in the region on the technique. 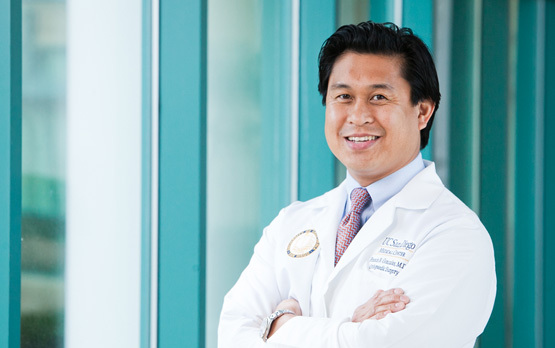 Gonzales, who is fellowship-trained in anterior hip replacements, is the only surgeon in San Diego performing the technique using computer-assisted navigation on a specialized surgical table from Mizuh OSI, which allows for live imaging guidance and manipulation in real time to confirm the hip replacement implants are precisely placed. The anterior hip replacement approach means faster recovery, no limitations with hip movement, and increased stability with potentially fewer dislocations for the patient. Most patients are candidates for the anterior hip replacement. Previous surgery, revision surgery or certain deformities may make an anterior approach not feasible. Gonzales said his team sees a significant difference in the first year of recovery in patients who receive an anterior hip replacement.